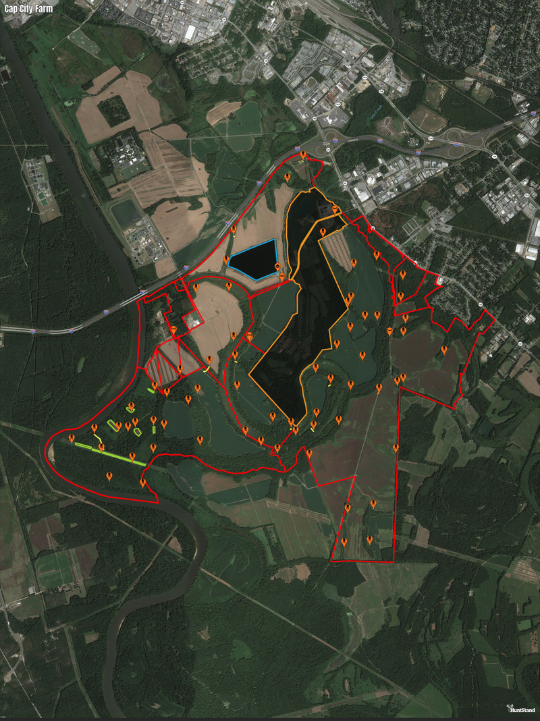 Powerful, useful, and as simple as possible, the HuntStand app can combine GPS satellite mapping, data analytics, and land-management functionality. It works on and offline by caching maps and weather, game, and asset data to your phone. This application enhances the safety and success of each hunt, and presents insights into the land and records of hunters and outdoor enthusiasts. Use our advanced mapping tools to easily create vivid and detailed maps of your Hunt Areas. Completely map out your Hunt Areas using our 45 distinct map markers. These cover everything from stands, blinds, and feeders to parking areas and structures. Easily add 5 types of lines including roads, trails, paths, fences, and “other” to your maps. Create 5 types of shapes including boundaries, food plots, sanctuaries, water, and “other” to your maps. Select from multiple base layers for your maps. These layers include public and private land owner boundaries, google satellite maps, and detailed topographical maps. Gain access to our national database of public and private parcel information. View and add property boundaries, see owner names, and show property size in acres. View property listings anywhere in the country. This tool shows you recreational land for sale close to where you hunt. View immersive property listings to further explore a listings’ attributes. Use this tool to accurately measure the area of any shape. This is great for determining how much seed or fertilizer you may need for a field or food plot. This tool can measure the distance between any two points or a series of points in feet, yards, or meters. This allows you to determine the length of a shot, see how far a stand is from another hunter or from a major food source, or plan things like where to park. Use this segment of the app to log sightings and harvests. Any log entries you make will automatically include the weather and solunar information at the time you made the Sighting or took the Harvest. It’s never been any easier to pattern animals in your Hunt Area. This feature allows you to view where your hunting friends are in real time while out in the field. Use our task management feature to log the location of tasks in your Hunt Area. Easily add pictures and notes to your tasks and sort by “completed” and “outstanding” activities. This is a great feature both for individuals as well as Hunt Areas managed by groups. Once you have created a detailed map of your Hunt Area you can order an incredibly high-resolution printed map in several materials in sizes up to 3ft by 4ft. You will not believe the clarity of these images. Click here to learn more. Our patent pending HuntZone technology allows you to see the impact of your scent over time in the most efficient way possible. We show wind speed, direction, and time in one simple unified package. Never get busted by the wind again. The LandZone follows the same concept as the HuntZone but is used for waterfowl hunting to determine where waterfowl will most likely land. You can plan your waterfowl set-up based on the wind speed and direction information from this tool. This tool shows you vital weather information for your selected Hunt Area. The 72 Hour weather segment allows our users to view hourly weather details three days into the future. The 72 hour Graph view allows users to view temperature, wind speed, chance of precipitation, and cloud cover on one unified and easily digestable view. You can “scroll” forward through time to find the perfect conditions for your activity. The 5 Day Forecast gives a high-level overview of the weather conditions over the next 5 days so that you can plan your outings accordingly. Our Solunar page includes sunrise/set and moonrise/set information as well as the AM/PM major and minor feeding times for your selected Hunt Area. This information will better enable you to plan hunting trips. Our News Feed shows actions taken by your friends and also includes articles and stories related to hunting and land management. Engage in group chats with all of the members of your Hunt Area. This is a great way to collaborate and share information. Edit maps as a group, but control access. Available for Android, iOS and web. We think you will agree, this is the best hunting app on the market.